Aseptic techniques refer to any method used to sterilize and maintain the sterility of an object or location, such as an operating theatre or laboratory, though it may also wound care to prevent infection. What are the fundamental rules of aseptic techniques? A number of basic procedures must be followed when handling sterile equipment or working in a sterile environment. These include: ensuring that the environment is free from external sources of contamination, such as open windows or doorways and ensuring that any tools or implements to be used have been thoroughly sterilized. In addition, all sterilized equipment should be easy to reach to prevent the likelihood of having to touch or lean on the surface. In the laboratory, working beside a Bunsen burner creates an upward flow of air through convection, lowering the risk that dust or other contaminants will settle on the sterile surface or equipment. Test tubes and other vessels containing sensitive biological samples should be flamed around the cap and neck as they are opened, to prevent contaminants entering the tube. Wire loops, also known as inoculation or smear loops, are frequently used in microbiology for the purposes of transfer and culture of microorganisms. They are sterilized by flaming over a Bunsen burner, being heated to glowing red, in order to ensure that all microorganisms present on the loop are destroyed. Disposable pipettes are also frequently used for the transfer of liquids, and should be removed from its packaging without touching the tip to any surface besides the liquid to be transferred. Pots of disinfectant should be kept close by, to dispose of such items without leaving the work area. The transfer of cultures between agar plates should be completed as quickly as possible, though in a controlled manner. Agar plates should be opened facing away from the user, and preferably only just enough to complete the work. This prevents contamination of the agar plate by microorganisms present in the air, fungal spores in particular. Tools, clothing and equipment able to withstand the pressures and temperature of an autoclave are usually sterilized in this way following microbiological work, though disposable items are becoming increasingly adopted in critically sterile fields such as surgery. Cleaning chemicals are frequently employed to sterilize an area before and after work, among the most common of which is simple ethanol spray. 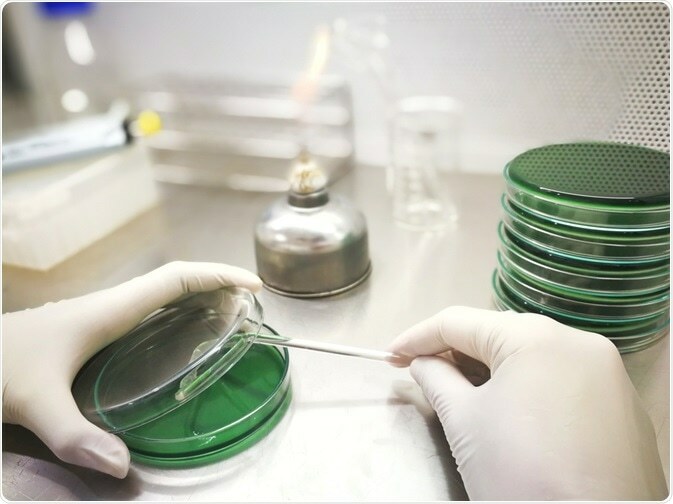 Standard personal protective equipment should be worn at all times in a microbiology laboratory, including safety glasses, disposable gloves, and a lab coat. Howie-type lab coats are usually worn in microbiology labs as they completely protect the wearer with a collar and wrap-around lapel. What advanced aseptic techniques are employed in microbiology? Research and industrial laboratories working with highly sensitive, dangerous, or expensive microorganisms utilize a variety of additional paraphernalia to ensure that sterile conditions are maintained. Laminar flow hoods or cabinets that keep a constant flow of air across a work surface ensure that no airborne contaminants will enter the space. Where required, larger spaces known as cleanrooms may be used that maintain laminar or turbulent air flow throughout the whole room. Finally, workers are usually required to use specialised furniture and clothing in these spaces to prevent the introduction of contaminants or infection by microorganisms being worked with. Aseptic Laboratory Techniques: Plating Methods. How is Contamination Prevented in a Cleanroom?